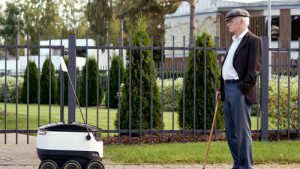 Delivery robots are taking a number of routes to making everyday appearances on your doorstep. See what the founders of leading hospitality, drone, and ground delivery robot companies say about this maturing market. LAS VEGAS — 2016 was a good year for all three panelists at the “Delivery Robots Knocking at Your Door” session at the Consumer Electronics Show here this month. 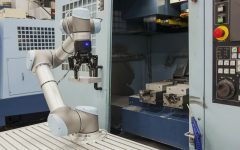 Each innovator in the first session of the Robotics Conference at CES 2017 has taken a different route to delivery robots, but their technologies and markets are maturing fast. Starship Technologies is testing its ground-delivery robots in nearly 60 cities worldwide, Savioke’s room-service robots are in 50 hotels, and CyPhy Works is conducting tests of aerial drone deliveries with United Parcel Service Inc.
How did the founders of these companies assess their prospective user base, and what can we expect from delivery robots this year? The leaders of CyPhy Works, Savioke, and Starship Technologies all said at CES 2017 that they expect delivery robots to become more routine this year. The market for automated deliveries will grow from $15 million in 2015 to $54 million by 2020, predicts Technavio. Robotic deliveries have some safety and technical hurdles to overcome, but testing is occurring, and major partners such as UPS and Mercedes-Benz are preparing for new markets. Starship Technologies is testing its delivery robots in nearly 60 cities. Savioke’s Relay will soon expand beyond hospitality. Savioke’s Relay and Starship’s delivery robot bring water to the panelists at CES.